Your privacy is important to us. To better protect your privacy we provide this notice explaining our online information practices and the choices you can make about the way your information is collected and used. To make this notice easy to find, we make it available on our home page and at every point where personally identifiable information may be requested. Our privacy statement is designed to inform you of the types of information we collect, how we use that information, and the circumstances under which we will share it with nonaffiliated third parties. This Privacy Statement covers all websites owned and/or operated by CFA Foundation. Presently, they include www.coloradofamilyaction.org and www.coloradovotersguide.org. CFA Foundation also uses a secure service to process online contributions. To the extent information is collected from you in connection with an online contribution, that information is also covered by this Privacy Statement. Internet sites (e.g., blogs, forums or social networking sites such as Facebook) that are owned or operated by others where CFA Foundation has a presence are not covered by this statement. CFA Foundation is the sole owner of the information collected on its sites. We will not sell, share, or rent this information to others in ways differently than we have disclosed in this statement. On some occasions, we may need to share information we collect from you with nonaffiliated companies in the financial services area, such as businesses engaged in banking, credit card issuance, and online payment processing, and with nonaffiliated accounting and bookkeeping firms. In order to use some CFA Foundation websites or web pages, a user may first have to complete a registration or contact-type form and provide certain types of information, often consisting of contact information such as name, address, and email address and sometimes including additional information. This information may be used by us to process a user’s online contribution or to provide the user with services and products which the user has requested such as email communications or written materials. We may also use this information to contact the user. Additionally, the information may be used to provide the user with immediate access to online information pertinent to that user, such as a personalized online voters’ guide. For CFA Foundation’s 2016 coloradovotersguide.org website, a user is required to provide his or her first name, last name, street address, city, state, zip code, and email address. That information is used by KnowWho, Inc., with whom CFA Foundation has contracted to provide a Candidate Directory Web Service, to identify for the user the state legislative and federal candidates who will appear on the user’s November 2016 General Election ballot. A persistent cookie may be transferred to your browser in situations in which you are first notified before the cookie is stored. For example, when you select a “remember” option on a web page, a persistent cookie will be stored in your browser on your computer or device solely for the purpose of automatically filling in the information you have asked to be remembered, such as a password or your address. We may use session cookies whenever you visit a CFA Foundation website for traffic analytics application and the site’s interactive applications, if any. Session cookies expire when you close your browser and are not permanently stored on your computer or device. If you feel uncomfortable with cookie technology, you can usually disable cookies within your browser settings. However, some functionality will be removed when cookies are disabled. CFA Foundation may partner with other parties to provide specific services. When the user signs up for these services, we will share names or other contact information that is necessary for the third party to provide these services. These parties are not allowed to use nonpublic personally identifiable information except for the purpose of providing these services. 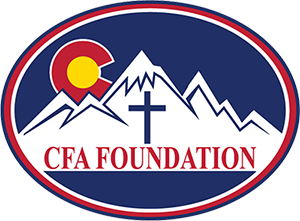 CFA Foundation’s websites may contain links to other sites not owned or operated by us or our affiliated organization, Colorado Family Action. Please be aware that CFA Foundation is not responsible for the privacy practices of such other sites. We encourage our users to be aware when they leave our site and to read the privacy statements of each and every website that collects personally identifiable information. CFA Foundation takes various precautions to protect our users’ information. When users submit sensitive information via one of our websites, your information is protected both online and off-line. If you have any questions or concerns about the security of our websites, please contact us by sending an email to info@cofamily.org. CFA Foundation’s emails contain a link at the bottom that allows you to unsubscribe from its emails if you so desire. If you would like to correct, update, add, or delete personal information, or to not receive postal mailings or phone calls from us, simply let us know by calling us at 877-239-7355 or sending an email to info@cofamily.org. By using this website and its services, you signify your acceptance of this privacy statement. If you do not agree with any policy described in the statement, your only remedy is to discontinue use of this website and its services. We reserve the right to modify our privacy statement at any time. If we change our statement, we will do our best to promptly post those changes on our websites so that you are always aware of what information we collect, how we use it, and under what circumstances we disclose it. Your continued use of any portion of the website following the posting of such changes will constitute your acceptance of those changes.